The first camps I made were stockades using toothpicks set into a sludge of flock and PVA. The guards are samples from Donningtons. 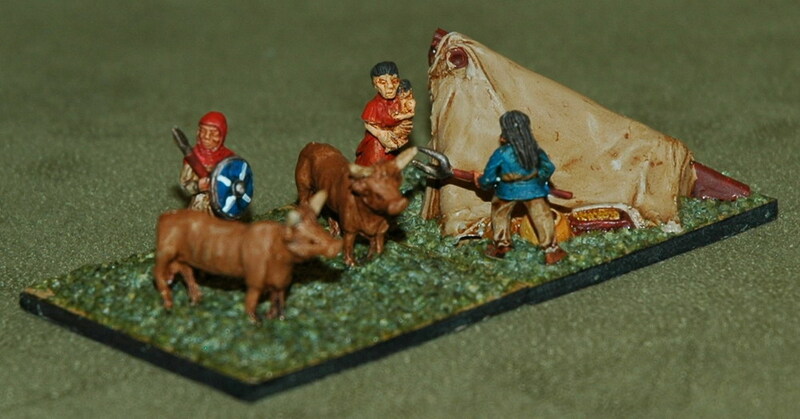 The next camps are a combination of tents and huts from Bauda with Corvus Belli civilian Celts given to me by a friend, Steve. I based them so that they could be used as baggage elements for DBMM (in the unlikely event I get enough figures to make an army for those rules), This allowed me to use them in combination with the animal baggage elements to make DBA camps (although there’s no room on them for a garrison element if I wanted to use one. 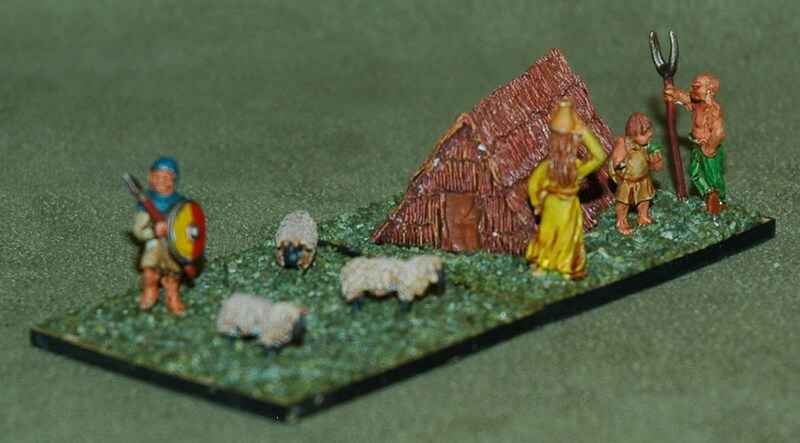 The herd animals are Irregular from Eureka and their herders are Feudal Castings figures. They are done so that the pigs have an Irish herder, the cattle a Scots one and the sheep a Welsh one. Man, up close that lady is one scary looking woman! No wonder he’s brandishing a pitchfork at her! Camps for the various HOTT armies are projects for the future. I’ve not given very high priority to them, however. In the short-term for the goblins I might remove the guard from one of the stockades and put a goblin or two in its place.